Benchmark Monitoring specialises in environmental compliance monitoring and data reporting systems for the mining, construction and power generation industries. The company manufactures its own line of instrumentation made in Australia (KABOOM®, NOISE HOUND®), and can supply instruments from all leading manufacturers. Benchmark Monitoring specialises in complete monitoring networks, including standalone solar-powered, or mains powered, air-conditioned systems. The company performs a range of services, including design, supply and installation of monitoring stations and complex telemetry networks such as 3G / 4G, microwave and serial radios. Benchmark Monitoring enables complex integration with existing systems, including on-site supervisory control and data acquisition (SCADA) systems, databases and reporting systems such as ENVIROSYS and PI Historian. Benchmark Monitoring hosts standalone data visualisation, database and reporting services, which are accessible through a secure web portal. Periodic reporting services (daily, weekly, monthly, quarterly, annually) and automated alarming systems via SMS and email are available. The company performs operation, ongoing support, calibration and maintenance to Australian standards and the best practice guidelines. Benchmark Monitoring supplies static field environmental monitoring and reporting services for all physical parameters. These include gases, dust deposition, high-volume air sampler, surface water, groundwater, soil and microbiological properties. KABOOM is a solar-powered standalone blast monitoring system designed specifically for mining applications and complies with AS2187.2-2006 standards. The system’s instruments monitor vibration and overpressure continuously and log that data in the on-board memory. Its web portal is a web-based data repository, reporting and management tool connecting to the instruments via the cellular network. Data is uploaded to the KABOOM® web portal automatically after a blast occurs, SMS and email notifications of peak results are sent simultaneously and are received within minutes post an event. Benchmark Monitoring supplies, installs and calibrates monitoring equipment in line with approved methods for compliance monitoring of PM10, PM2.5 and TSP. Benchmark Monitoring can design, provide and install a fence line monitoring system to meet your requirements. Available solutions include early warning dust systems, dust suppression and control systems for ash dams, coal stockpiles and overburden dumps, as well as leak detection of toxic gases such as NOx, H2S and benzene. Benchmark Monitoring supplies noise monitoring management systems to ensure sites comply with licence requirements. Omnidirectional monitoring is available using the company’s NOISE HOUND® monitoring system, along with directional monitoring systems from leading suppliers. Benchmark Monitoring supplies tailored onsite water management and compliance monitoring systems to measure water quality parameters such as pH, electrical conductivity, turbidity, dissolved oxygen, oil on water, temperature, flow-rate, and discharge volume. We can design and install your water monitoring system, including discharge channel and weir design. Benchmark Monitoring is actively involved with the Hunter River Salinity Trading Scheme (HRSTS). Benchmark Monitoring can supply and install meteorological monitoring stations comprised of instruments from leading manufacturers to measure a wide range of parameters. The company’s systems measure characteristics such as wind speed and direction, sigma theta, temperature and differential temperature, lapse rate, relative humidity, solar radiation, evaporation, rainfall, as well as barometric pressure. 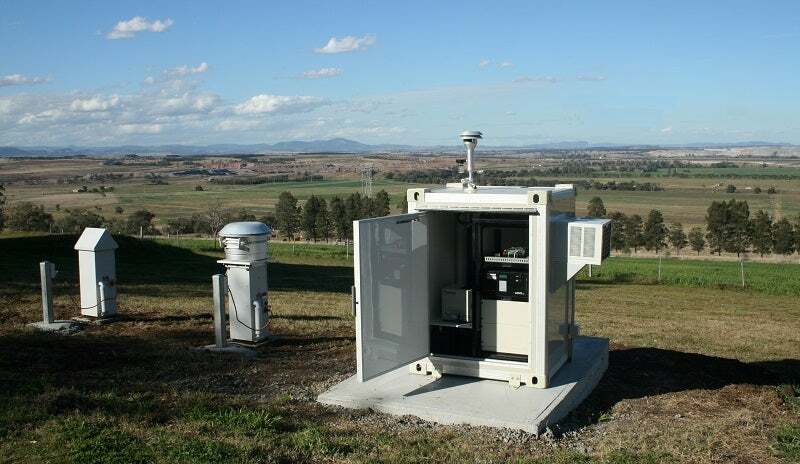 Weather monitoring solutions are fully customisable meet Australia Standard AS3580.14-2011 and engineered to suit specific applications and requirements. Benchmark Monitoring offers PM10, PM2.5 and TSP-compliant dust monitors, noise monitors, blast monitors, weather station, NOx and other ambient gas monitors. The company offers complete walk-in air conditioned enclosures, as well as portable solar-powered systems. The Noise Hound is an omni noise monitoring system designed specifically for mining and heavy industrial applications. The latest solution for real-time compliance monitoring of air blast and vibration for the mining and construction industry. DV3000 offers a new approach to multi-gas analysis with its real-time robust, highly flexible mobile and fixed instruments. AQMesh provides a cost-effective monitoring solution enabling higher geographical coverage and better spatial resolution than conventional monitoring systems.